December | 2016 | The British in Crete, 1896 to 1913. 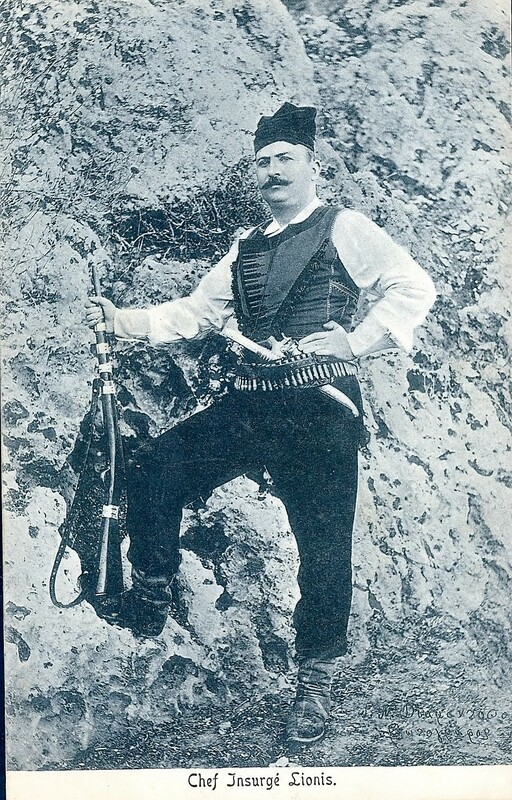 The British in Crete, 1896 to 1913. Every picture tells a story…but not necessarily a true one. Upon the wall … now rose against the clear sky of dawn a great structure on beams and planks surmounted by a box-like hut. Within the walls of the latter, invisible to the spectators, stood an executioner with an axe and block complete. Like a medieval headsman this brawny Victorian Highlander leaned upon the instrument of vengeance, grimly awaiting the signal to launch a dozen blood stained miscreants into eternity. And there the medieval parallel ended, for no victim’s neck was to be laid on the block, no blood would stain the axe. Despite the Tower Hill suggestion, justice was to be administered in strict accordance with modern ideas. Over the block was stretched a rope, the key rope of a tangle which upheld the fateful platform; and on the platform, bound, a noose round each neck, stood the first batch of murderers accountable in all for some 700 lives. In England a public execution is unthinkable; as an example to the fanatical hordes of the East it is often imperative for the common safety. The gallows was of a design set up on the highest point of the city where none could fail to see it. Grimly impressive to spectators standing aloof on ships’ decks, the scene must have daunted guilty onlookers within the city walls. The row of doomed sinners silhouetted against the sky, the wailing of the Moslem women, the poignant notes of the “Last Post,” all in sharp contrast with the brilliance of the morning, I see and hear them again as though it were yesterday. Hark! The clarion call of the bugle, clear and resonant on the morning air. So pregnant with doom are its two ascending notes that even the wailing of the women is momentarily hushed in an awe stricken silence. “Lights out!” Save perhaps the stroke of the avenging axe it is the last sound heard by the ragged morituri ere they drop into the unknown. 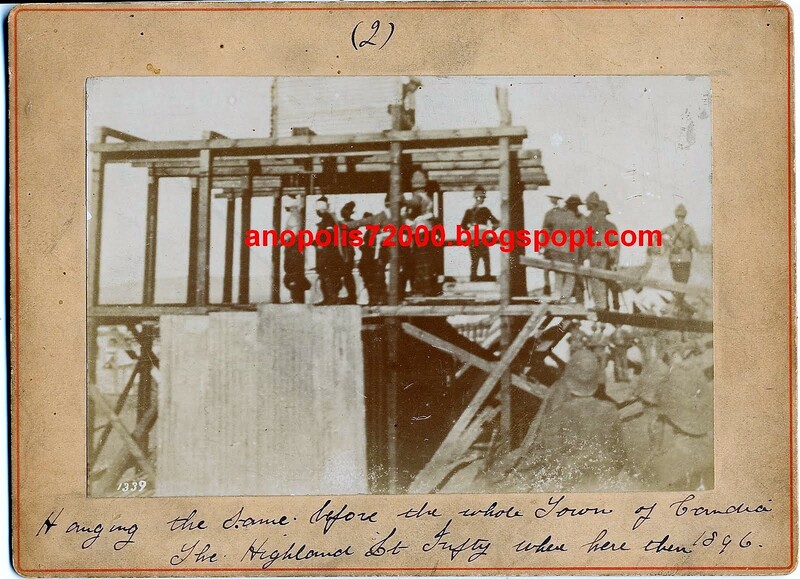 The photographs below show the preparation for one of the three public executions carried out by the British, the lower photograph showing the bottom of the ‘box-like hut’ on top of the scaffold. Preparations for the execution of rioters involved in the murder of British troops or citizens. Candia 1898. The execution of rioters involved in the murder of British troops or citizens. Candia 1898. 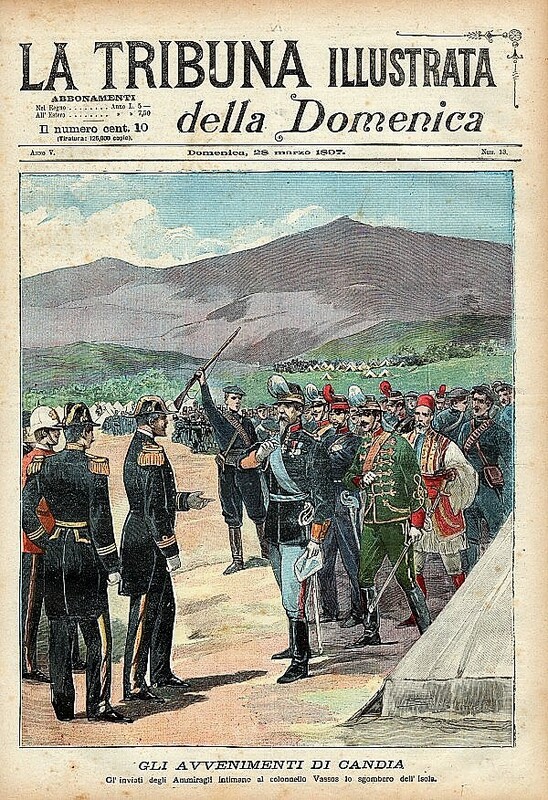 While the photographs, and a number of British magazine illustrations, give what one can assume is a fairly accurate impression of these particular events, the need for accuracy didn’t seem to apply to the reportage in at least one Italian magazine. That the British are displayed as acting in a particularly brutal manner is, on the face of it, surprising given that there appears to have been little or no friction between Italian and British troops on Crete, unlike the relationship between French and Italians. The explanation is related rather to the geo-political aspirations of certain parts of the Italian press and polity. 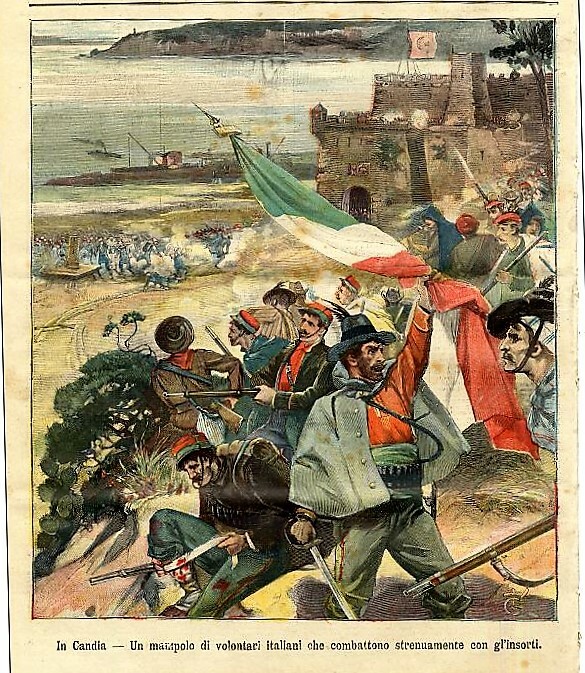 Although only finally united as a nation-state since 1870, there was a distinct Italian movement seeking the creation of an Italian Empire and expansion into Ottoman controlled territories bordering the Mediterranean, a movement which would in time result in the Italian-Ottoman War of 1911/12 and Italian occupation of Libya and the Dodecanese. 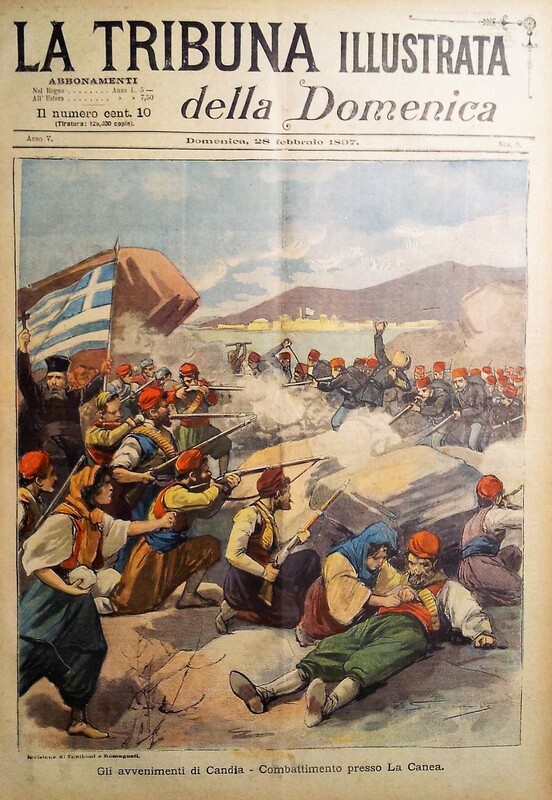 Back in the 1890s though, parts of the Italian press were clearly supportive of the Cretan Christian insurgents – as their illustrations of the supposed events in Crete showed – which makes the anti-British illustration showing some sympathy for the Cretan Muslims, all the more unusual. 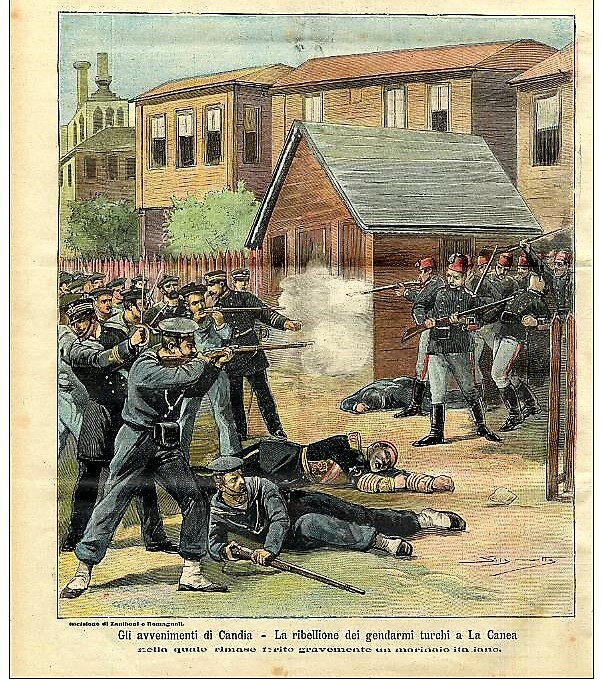 For the record; the firing during the mutiny of the Gendarmerie took place inside the building, one Italian seaman was wounded. For the record; In spite of the apparent warmth with which the Admirals are greeting Colonel Vassos, the purpose of the meeting was to deliver an ultimatum to Vassos to withdraw his men from Crete or to face the consequences. For the record; Few, if any encounters between Cretan Christian insurgents and Ottoman regulars are recorded as involving involved close quarter fighting; mostly it was a case of the insurgents opening long distance fire on the regulars, be they Ottoman or later, British. For the record; While there were rumours that a small number of ‘Garabaldians’ had gone to Crete to fight for the Cretan Christians, there is no apparent record of them taking part in any action, let alone getting involved in the conflict under an Italian flag. 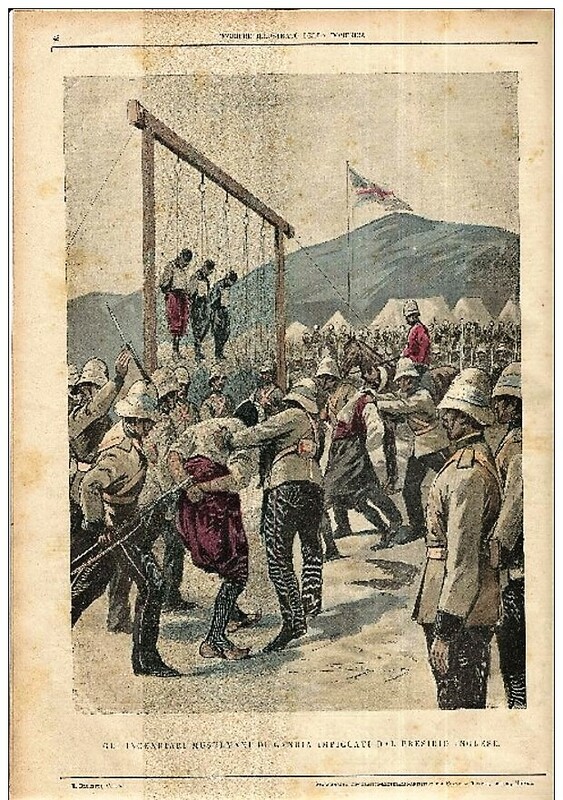 Footnote: The photographs of the executions were taken by a commercial photographer R. Behaeddin, turned into postcards and subsequently sold to British soldiers. While it could be expected that these macabre souvenirs would be bought by those there at the time of the executions in 1898, they were still in circulation among British troops as late as 1906/07, one being bought by a member of 2/Royal Sussex while serving in Crete at that time. This entry was posted in European Intervention Crete and tagged Crete 1897, Crete 1898, European Intervention Crete, Italian troops Crete 1897, Italian troops Crete 1898 on December 28, 2016 by Mick McT. 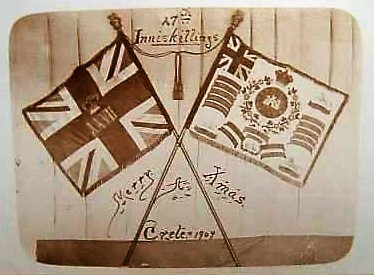 The 1/Inniskilling Fusiliers spent the Christmas of 1907 in Crete. In the midst of their other duties, one of the battalion at least managed to find the time to send home an appropriate Christmas card. One of them at least had some idea of the climatic conditions awaiting them over that Christmas. 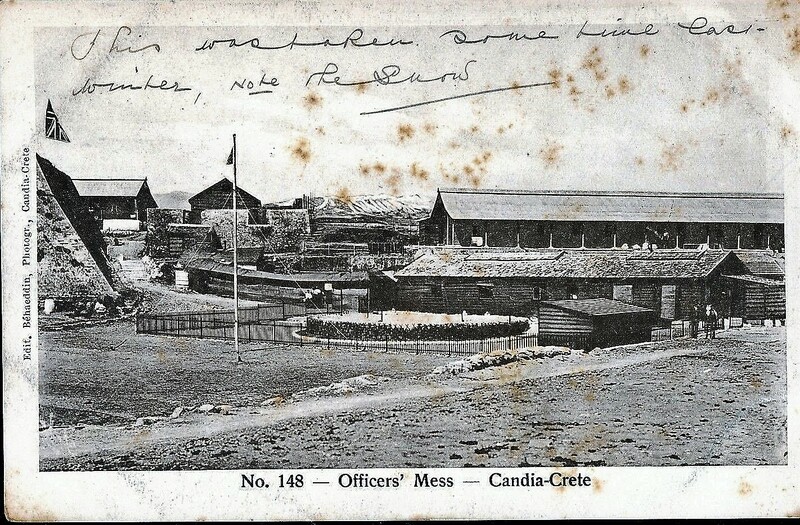 A member of the battalion named Sid, referred to in previous posts, purchased a commercially produced postcard, apparently taken in 1906 or earlier, which, according to his annotation, shows snow on the Officers’ Mess in Candia. 1908[Cd.4057] Army Medical Department report for the year 1907. Vol. XLIX p.60. 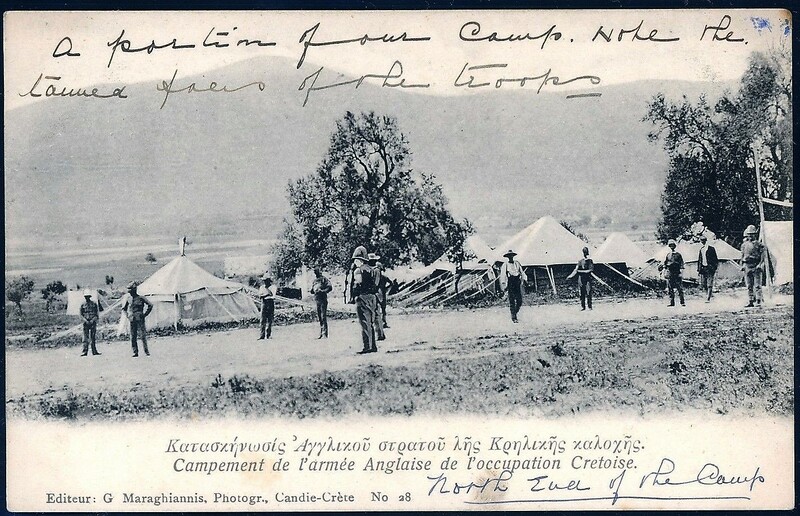 This entry was posted in British Army in Crete, European Intervention Crete, Inniskillings and tagged 1/Inniskilling Fusiliers Crete, Cretan Autonomous State, Crete 1907, European Intervention Crete, Inniskillings, Κρητική Πολιτεία on December 20, 2016 by Mick McT. 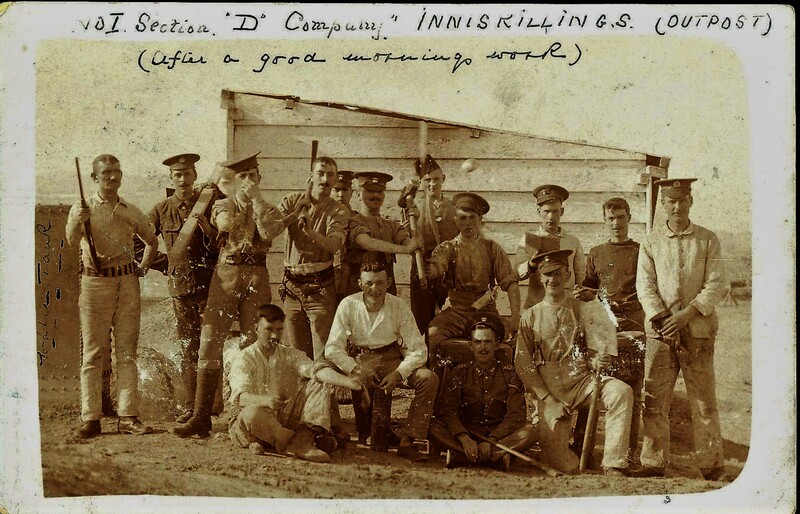 Between February 1907 and February 1908, the 1/Inniskilling Fusiliers were stationed in Crete. A series of postcards, annotated in the same hand and apparently written by a member of the Battalion who signed himself ‘Sid’ have recently appeared. 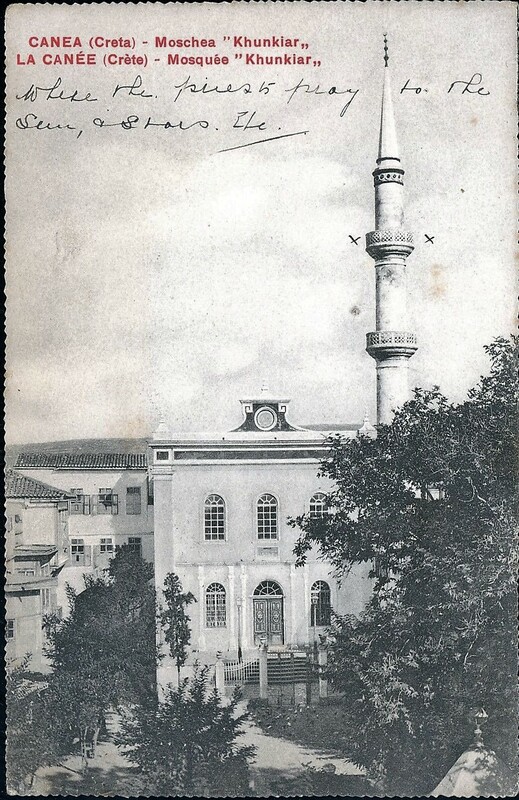 Most are commercially produced, but at least one appears to be privately taken photograph which was then turned into a postcard. Some of these images are shown below with as much of the annotations as are possible to transcribe, with the spelling and punctuation as the original. 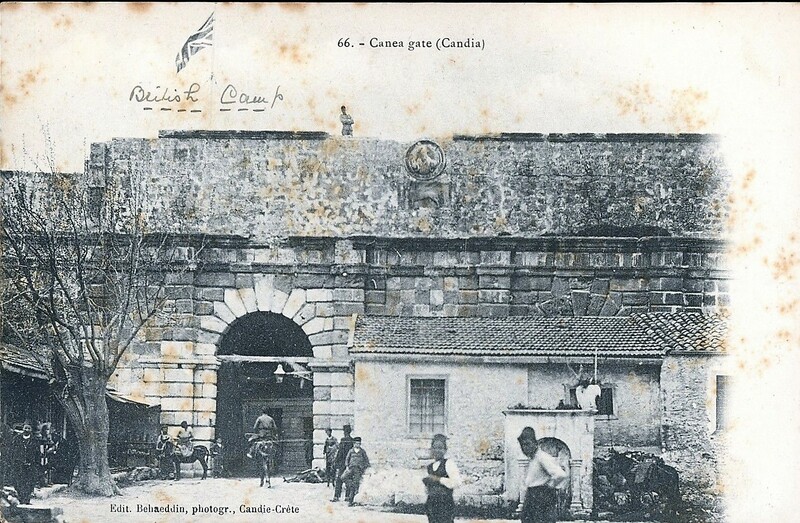 Text on reverse of postcard: This is a view of the ramparts you can see how we overlook the town, the Canea Gate is closed every evening at Sunset and Sentries are posted outside the gate and inside along with a Quick Firing gun. Front text: our look out station, we have a full view from this point. Reverse text: our Cemetery is railed off from the Greek and Armenian portion. Sid. 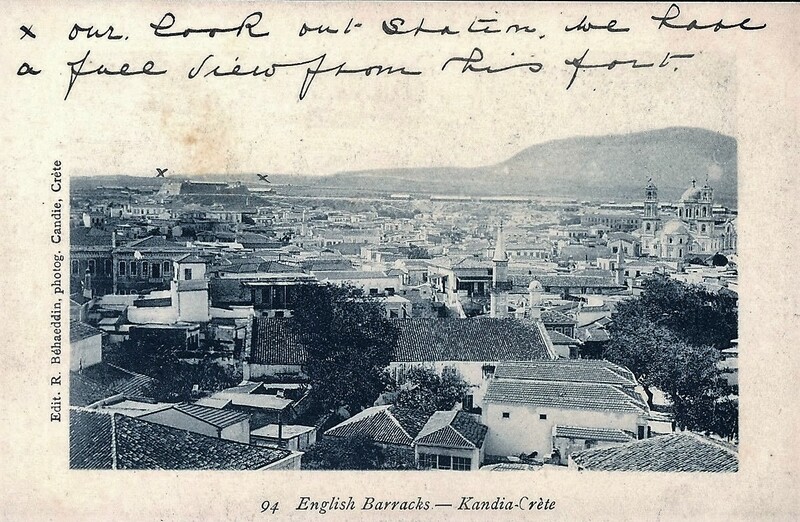 The time in Crete was not all spent sight seeing – the instability of the political situation on the island was still apparent and the British soldiers’ views of the Cretan insurrectionists were not necessarily complimentary. 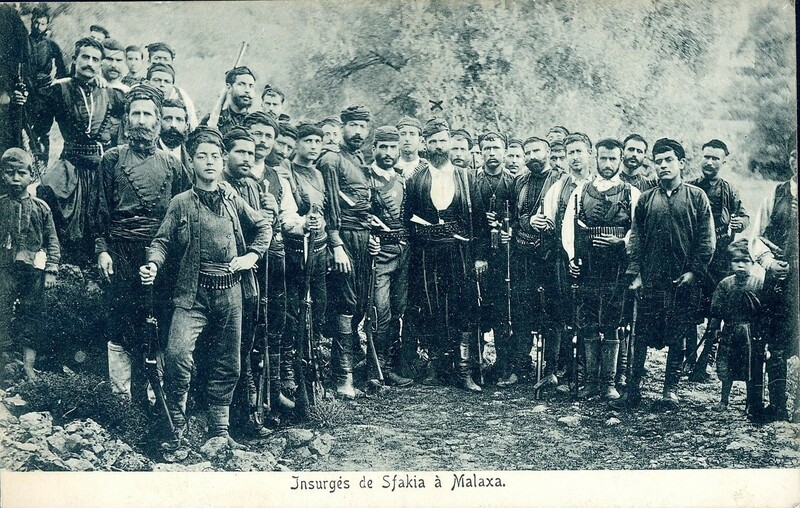 Reverse text: Another group of insurgents who were caught on the hills – many of them lived by Brigandage. 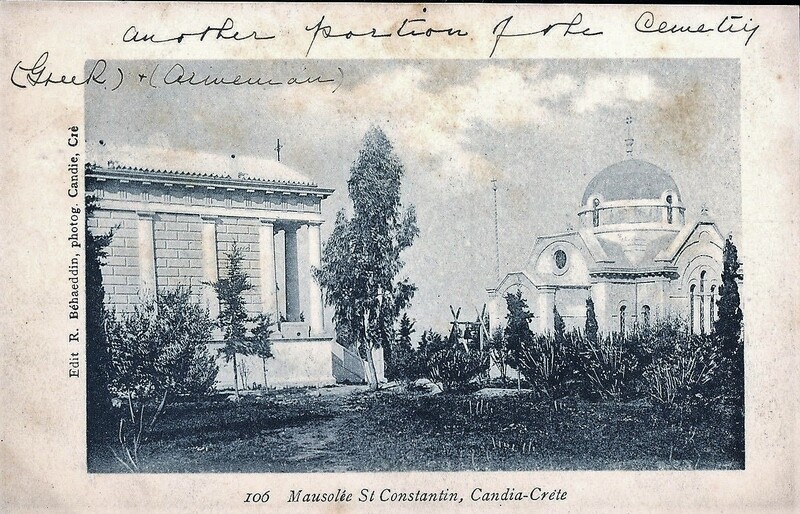 The above was a professionally produced post-card which apparently dates to around 1897 when Cretan Christian Insurgents attacked the Ottoman outpost at Malaxa, above Canea. This was 10 years prior to the arrival of the Inniskillings on Crete. 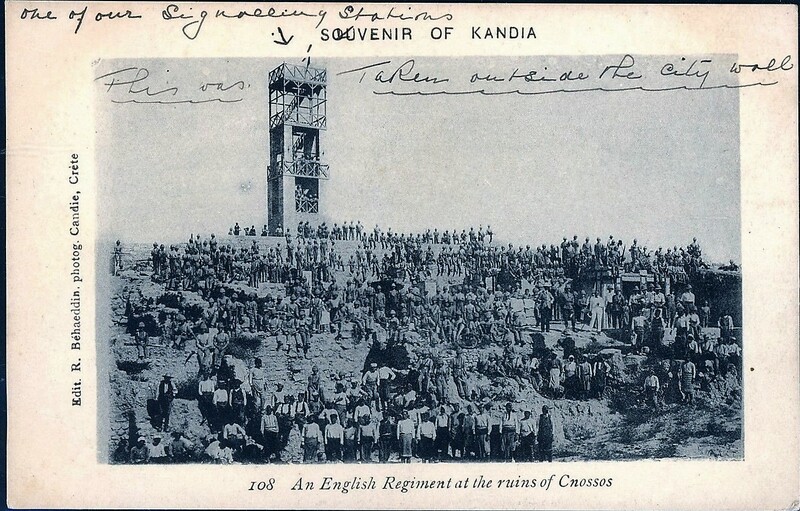 As well as the main garrison in Candia, British troops also manned smaller outposts throughout the British Secteur. 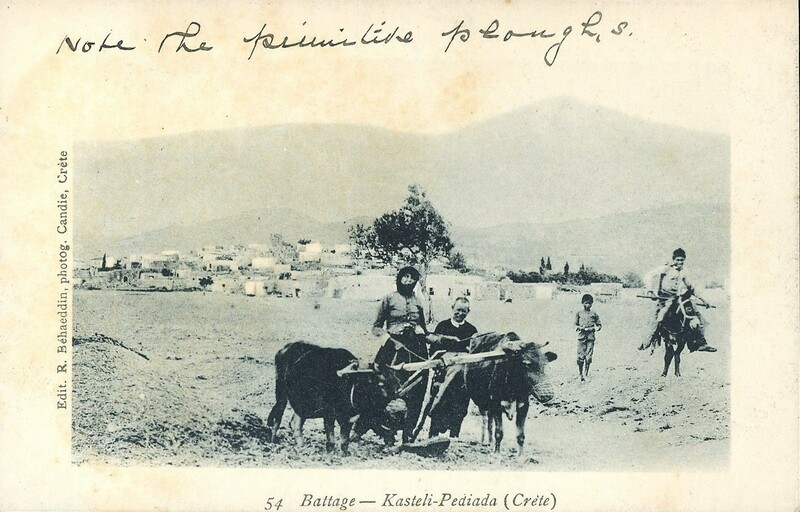 While the privately produced photograph below doesn’t specify where it was taken, one of the commercial postcards refers to Pediada, one of the main outposts, and it is possible that it was taken at the outpost there. Quite what had constituted a ‘good mornings work’ in this case is anyone’s guess. However the soldier on the extreme left is holding what appears to be an air-gun or small rifle, certainly not the standard infantry rifle in use at the time, while others are armed with planks of wood, pick-axes and pick-axe handles; this might suggest they’ve been on a rat-hunt. 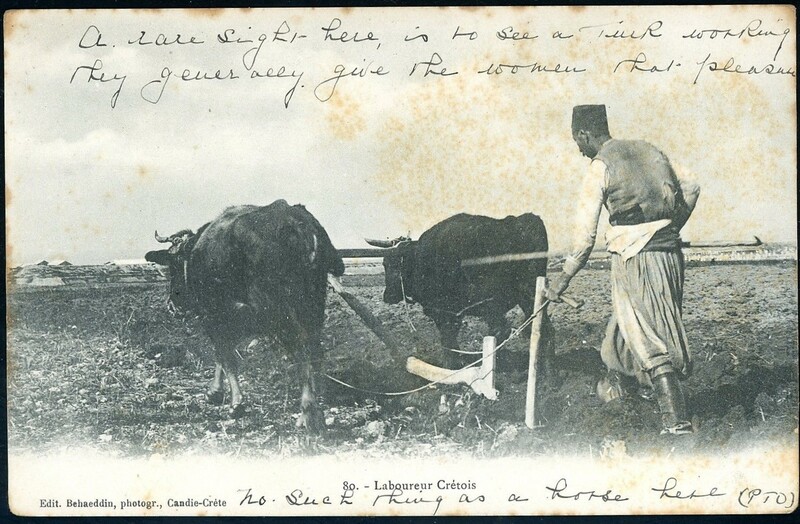 This entry was posted in British Army in Crete, European Intervention Crete and tagged 1/Inniskilling Fusiliers Crete 1907, Candia, European Intervention Crete on December 2, 2016 by Mick McT. 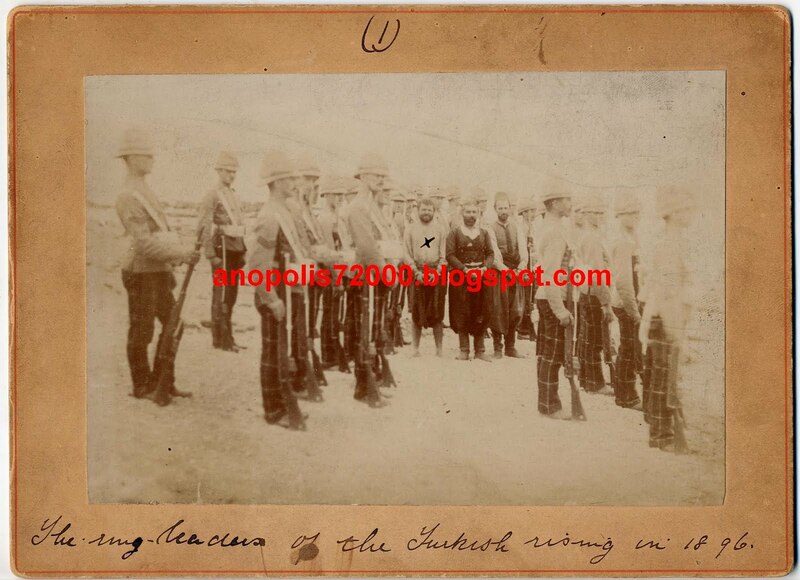 The Sarakina massacre – the cycle of revenge. The British army make a profit out of Crete!